Christmas Movies, Christmas Films Page 3 at Santa's Net. 1983, 98 minutes, Peter Billingsley, Darren McGavin, Melinda Dillon, Ian Petrella, Scott Schwartz, Tedde Moore. Movie about growing up the 1940s. 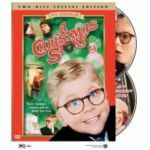 Billingsley plays the young boy and we discover the simple yearnings, like wanting to own a Red Ryder BB gun for Christmas. 1951, 86 minutes, Alastair Sim, Jack Warner, Kathleen Harrison, Mervyn Johns, Hermione Baddeley,Clifford Mollison. Sim is outstanding as Scrooge. It is an excellent portrayal of Charle Dickens' famous Christmas classic. 1991, 92 minutes, Harley Jane Kozak, Jamey Sheridan, Ethan Randall, Kevin Nealon, Thora Birch, Leslie Nielsen, Lauren Bacall. Two kids (Randall and Birch) try to get their divorced parents back together again for the Christmas holidays. 1985, 112 minutes, Dudley Moore, John Lithgow, David Huddleston, Burgess Meredith, Judy Cornwell, Jeffrey Kramer, Christian Fitzpatrick, Carrie Kei Heim. Interesting story behind Santa's North Pole operation, workshop, reindeers and elves.